This top took about an hour and is for my St Ann's charity group. Numbers on the sidebar for my stash report. 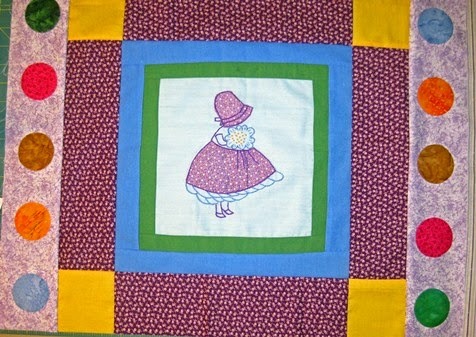 I added another row of appliqued circles to my Happy Scrappy Orphan block quilt. Need to work on this more as I'm getting behind, but what else is new? 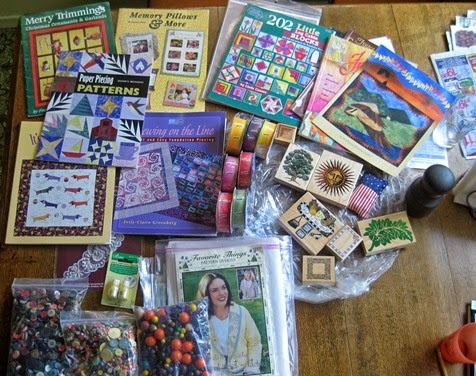 I got my huge box of Goodies from winning Rhonda's giveaway! So many goodies! Just wanted to say a big thank you to Rhonda at Ravelly 1 for this. More on this later. 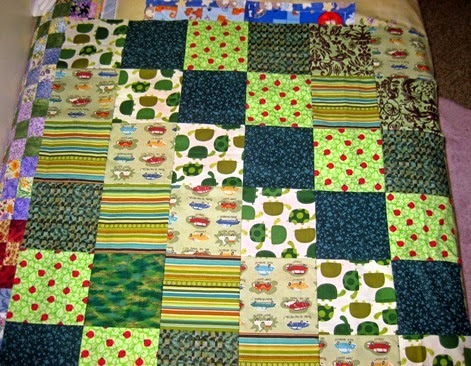 I'm linking to Judy's Patchwork Times, Lyn's BOMs Away, Connie's Linky Party Tuesday and Esther's WOW as I have done some applique. Phew - now off for two days of fun with my cousins and Mom in Temecula. See you for Hexie Weekend which is still open til Monday, midnight. I totally love those circles around her! Lucky you, what a great win.